New Year’s resolutions are in full effect right now. Like most of you, I have taken time to write out a few goals to keep in mind as I make my way through 2012. But did you know that over 50% of people make the “Save more money” resolution? And a whopping 75% make some type of “Get Healthy/Fit” resolution? What’s even more astonishing; cooking with fresh mushrooms can help you achieve these goals in 2012. Fresh Canadian mushrooms are a nutrient dense food, and are available year round, making them a great value for your health and your pocketbook. When it comes to vitamins & minerals, including riboflavin, niacin, pantothenic acid, copper, phosphorus, potassium and selenium, fresh mushrooms make a great choice. A ½ cup serving makes an important contribution to daily intakes of folate, thiamin, vitamin B6, iron, magnesium and zinc; all vital to good health. Mushrooms also contain both soluble and insoluble fibre. Because fibre helps make foods more satisfying, one tends to eat less, and that can translate into weight loss and maintaining a healthy weight. Antioxidants are the heroes of cell preservation. Recent research has found that both raw and cooked mushrooms contain a powerful antioxidant called ergothioneine. Portabella and crimini mushrooms have the most, followed by white button mushrooms. We all know how expensive meat can be. One way to use fresh mushrooms to lower your grocery bill is to use it as a meat extender. Simply replace half of the meat with fresh mushrooms. For example, use a mixture of 50% finely chopped mushrooms with 50% lean ground beef in your burgers, lasgana, or tacos. Or slim down on the portion of steak, and top it with grilled portabella slices. It’s easy and healthy. 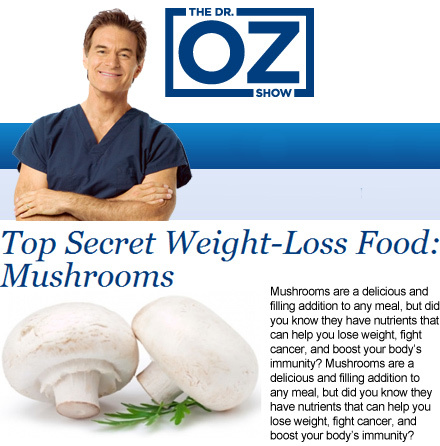 Dr. Oz’s Top Weight Loss SuperFoods: Mushrooms! 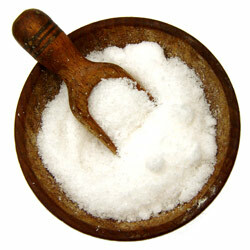 Did you know that Canadian adults consume an average of 3,092 mg of sodium daily. That is more than double the 1,500 mg recommendation by Health Canada. In fact, it exceeds the tolerable upper intake level of 2,300 mg.
That is quite an amazing statistic! Personally, I make conscience decisions throughout the day to cut back on my sodium intake, because the truth of the matter is, sodium is in almost everything. From cereals to salad dressings, to pre-packaged microwaveable lunches and even your pizza, it’s there and in surprising high levels. Cutting sodium might not be as simple as not putting salt in your food. Reading the Nutrition Facts Panel on your food before you purchase can also help cut back. Look for foods that have a “Low Sodium label” or are under 5% DV per serving. Eating more fresh fruits & veggie on regular basis can also help cut out sodium. Including fresh mushrooms is a quick & healthy way to make the cut. A 100g serving of fresh Canadian white button mushrooms contain only 4 mg of sodium. In addition, a serving of fresh mushrooms provides 8% of your daily requirement of potassium. Foods high in potassium and low in sodium may reduce the risk of high blood pressure, a risk factor for stroke and heart disease. Also, mushrooms contain Umami, which helps to boost the flavours of your food, meaning less salt is required to taste. Substitute ½ cup of white mushrooms for ½ cup of cheddar cheese in your omelette or scrambled eggs. Save 349 mg sodium. Substitute 1 cup of grilled portabella mushrooms for sausage in pasta. Save 632 mg sodium. Try “white buttons and dip” instead of “corn chips and dip.” Save 552 mg sodium. To learn more about cutting sodium from your diet visit Sodium101.ca. What are you doing to watch your sodium intake? Questions from You: What is the GI of the mushrooms? Q: What affects do mushrooms have on my blood glucose levels? A: The Glycaemic Index (GI) is used to measure the effect of carbohydrate-containing foods on bloog sugar levels. Mushrooms have so little carbohydrate that the GI of mushrooms is close to zero. What this means is, eating mushrooms has no real effect on blood glucose levels. So, if you have to watch what you eat because of diabetes then mushrooms fit very neatly into your diet. As mushrooms are very low in salt and fat, and contain no cholesterol, they also fits into the diet of people with high cholesterol, high blood pressure and the weight watcher. Recent research has found that mushrooms contain a powerful antioxidant called l-ergothioneine. Antioxidants are the heroes of cell preservation. They work by slowing or preventing the oxidative process caused by free radicals that can lead to cell damage and the onset of problems like heart disease and diabetes. Including versatile and delicious mushrooms in the diet is a good way to boost antioxidants. Researchers at the Pennsylvania State Mushroom Research Laboratory found that mushrooms contain significant levels of ergothioneine, which has shown antioxidant properties as a scavenger of strong oxidants. Antioxidant activity is enhanced by the presence of selenium. A 100 gram serving of white mushrooms provides 15% of the Daily Value for selenium. Ergothioneine is heat-stable, meaning it is present in both raw and cooked mushrooms. Portabella and crimini mushrooms have the most ergothioneine, followed closely by white mushrooms. Exotic mushrooms, such as maitake, oyster and shiitake, have the highest amounts of ergothioneine. How are you preparing antioxidant packed mushrooms this weekend?